Happy New Year to all of our wonderful couples! We hope you had an amazing Christmas too! We can't wait to perform at your 2019 weddings and we are starting the new year in style by performing at the gorgeous Wood Farm Wedding Fayre near Daventry, Northamptonshire (NN11 3BH) on Sunday 6th January 2019. It’s going to be a great day to come along and see us live, there will also be lots of other fantastic recommended wedding suppliers too, and of course it’s the perfcet opportunity to see Wood Farm in its beautiful winter splendour. We'll be performing live between 12pm and 4.00pm so for further details, please get in touch - enquiries@taylormadeacoustic.com or call/text 07976 096 347. We are absolutely delighted to announce that Taylormade Acoustic Duo & Live Band have become recommended suppliers to the beautiful, exclusive use Wood Farm Wedding Venue in Everdon - just minutes away from our home in Northamptonshire. We’ve also been invited to perform at their annual ‘Wood Farm Christmas Fayre’ on Saturday 24th November and there will be around 30 local businesses selling homemade crafts, Christmas gifts, food treats, clothes, hot food and drinks, plus there will be a festive number or two from Taylormade! Rebecca and the team at Wood Farm can't wait to see you there, and neither can we, so come along and get in the Christmas spirit with us on 24th November! Wow! What an amazing Facebook review from the lovely Mala and Mark Burns whose wedding we played on 13th July at The Quorn Country Hotel in Leicestershire. It says: "Where do you start with this amazing group of people? We booked our wedding at 4 months’ notice and we had a very clear idea of the type of day we wanted. However, because of the short notice we were worried we might not be able to create exactly what we wanted. After booking the legal formalities we started to look at entertainment. We did some research and came across Taylormade Acoustic Duo and Live Wedding Band. We watched some trailers and decided they were exactly what we were looking for. However, would they be available at short notice? They were, and you have no idea how grateful we were. From the first contact to the day itself, their passion and professionalism has been obvious. Carley is a dream to deal with and filled us with confidence. We went to the public showcase and they were even better live than in their online promotion stuff. On the day itself, they did so much to create the vibe we were after for our wedding. Carley has such an amazing, beautiful voice she made people cry during the ceremony (including the groom!) They worked tirelessly all day to keep the mood and atmosphere perfect and in the evening were amazing. I don’t think the dance floor emptied from the first song to the last. In between Matt did an amazing job with the DJ set and kept the mood exactly as we wanted it. He even turned his hand to tambourine when our boys surprised their mum with a Saxophone piece! Nothing was too much trouble and he even played the Bollywood playlist we asked for. 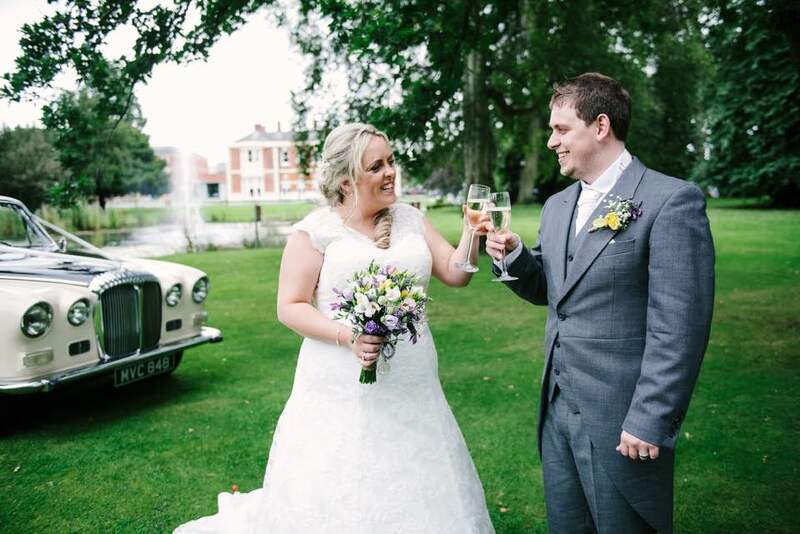 This band was the perfect accompaniment to our wedding day, so hardworking and accommodating but above all brilliant." Mala and Mark - thank you so much for your kind words and for having us be a part of your day. You are such a lovely couple and we wish you all the very best for your lives together as Husband and Wife. We are absolutely over the moon to announce that Taylormade Acoustic Duo have become preferred suppliers to the gorgeous Skylark Farm Wedding Venue. Situated near Daventry, with stunning views over the rolling countryside on the borders of Northamptonshire and Warwickshire, Skylark Farm takes your breath away and you can even 'glamp' on site to make this a truly special venue for your wedding. Conveniently, Skylark Farm is also one of our most local wedding venues, being just a 7-minute drive from our base in Daventry, Northamptonshire. We first visited Skylark Farm back in August 2017. We had been booked to perform with our Acoustic Duo at Charlotte and Stuart's wedding and performed during their Wedding Ceremony, played a set during their Drinks Reception in the beautiful grounds and one final set as they dined and sipped champagne during their Wedding Breakfast. We met the lovely owners, Sam and Dave, who took a video of us performing as they had been enjoying us so much. When it came time to leave, Sam asked us for our business cards and said she absolutely loved our Acoustic Duo and wanted to recommend us to her couples! And the rest is history. So, if you are looking for a gorgeous wedding venue, with a planning team that are second to none, you should come along to the next Wedding Fayre which will be on Sunday 7th October 2018 where we will be performing live with our Acoustic Duo. If you have already booked Skylark Farm for your special day, ask Sam or Lamorna about the stunning soundtrack we can add by having Taylormade Acoustic Duo or Live Band at your wedding. You can also watch our beautiful Taylormade Acoustic Duo Promo Video here. We look forward to hearing from you - if you would like a quote for your Skylark Farm Wedding, please Get In Touch. Above: performing during Charlotte and Stuart's wedding Ceremony at Skylark Farm on 5th August 2017. We are so excited to release our brand new Acoustic Duo promo video! Taken at the gorgeous Crockwell Farm Wedding Venue in Northamptonshire, this video shows you how we will add a stunning soundtrack to your wedding or bring a real spark to your event or party. The video shows us performing 6 tracks, designed to show you our range and the variety in our set list, but most importantly to allow you to see why our Acoustic Duo is perfect for Wedding Ceremonies, Drinks Receptions, Wedding Breakfasts and even early evening sets to include a live performance of your First Dance. The video was filmed and directed by Jonathan Ruffle from Fresh Wed Wedding Videos. Between our vision and Jonathan's, we worked hard to create exactly what we wanted from our video. Rather than a bland, static video, where we would just be sat performing several songs in one location, we absolutely love how the video tells a story, taking you from romantic performances inside the Wedding Barn during the daytime, to a more upbeat, feel good vibe as the sun goes down. We hope you love the video as much as we do and now you can see, as well as hear, just how we can add a stunning soundtrack to your wedding or event. Taylormade Acoustic Duo - Brand New Video! We are very excited to announce that we will be filming a brand new Taylormade Acoustic Duo video next week. We are so lucky to be shooting this at the breathtaking Crockwell Farm Wedding Venue in Eydon, Northamptonshire and to have the incredibly talented Jonathan Ruffle from 'Fresh Wed' filming and directing. We had originally planned to film our video in March, but the 'Beast From The East' and it's snow and sub zero temperatures prevented us from being able to film or perform outside. Well, seeing as Crockwell Farm has such gorgeous grounds, we decided to postpone until the weather warmed up and we could make the most of this beautiful wedding venue, filming in several locations. So we've now got our fingers and toes crossed that the sun will be shining next week and so far it's looking good! Keep your eyes peeled over the next few weeks for some behind the scenes footage and sneaky peeks! We are very proud to introduce our most recent acoustic duo demo - Latch by Sam Smith. We performed this beautiful acoustic version of 'Latch' by Sam Smith for Julie and Ian Bishop's First Dance at their wedding back in November at the beautiful Blackwell Grange Wedding Venue. After the wedding, Julie and Ian got in touch to ask us whether we could record it for them as a keepsake of their day, so we went into the recording studio a few weeks ago! "Thank you so so much for the CD! We absolutely love your version of 'Latch' and have listened to it so many times already. We definitely prefer it to the original!" Last night we headed to the beautiful Crockwell Farm wedding venue in Eydon, Northamptonshire which is just around the corner from the historic Canons Ashby - a Grade 1 listed Elizabethan Manor House which was built all the way back in 1550. Now, we can't say that Crockwell Farm has been around for quite that long but it is one of the most beautiful wedding venues in Northamptonshire and the UK, and we are very proud to have been preferred suppliers there for almost 7 years now. Owners Hermione and Bay Harper are the original Crockwell Farm couple, having held their own wedding reception there back in 1987! Since then Hermione and Bay have transformed Crockwell Farm into the breathtaking venue it is today. Couples had been invited to attend the Open Evening between 6.00pm and 9.00pm and there were a lovely mix of couples that had already booked Crockwell for their big day and those viewing the venue for the very first time. We performed some beautiful acoustic tracks such as 'At Last' by Etta James, 'Let's Stay Together' By Al Green and a brand new track 'Latch' by Sam Smith as guests arrived and were given a glass of champagne and shown around the venue. We met lots of new faces and chatted with some couples who had literally got engaged within the last couple of weeks and were in the very early stages of planning their weddings, and others getting married this year just looking to book the last few details. Our table and TAYLORMADE letters received a lot of love and we had a fantastic time chatting away and performing throughout the evening. On Saturday 24th February we headed to Banbury's Castle Quay Shopping Centre as guests and recommended suppliers of 'The Wedding Emporium'. As a recent addition to their recommended suppliers list, we had been invited to go along to perform and meet with lots of the couples who are currently planning their wedding with Catriona and Sarah and as you can see from these videos we had a great time! At first it was a little weird for myself and Matt, we've never performed in a shopping centre before, but shoppers quickly started to enjoy the live music and we even had a couple dancing away in front of us! At one point a lady stopped and said "She has such a good voice, so much better than that rubbish you hear on the telly!" and walked away! Well, what could we say to that?! We played some of our favourite songs including 'Rather Be' by Clean Bandit and 'The Way You Look Tonight' By Frank Sinatra, both of which were captured on the videos included here. We also chatted with lots of couples about the prosect of performing for them on their wedding day and it was great to be able to show how we can add a stunning soundtrack to their special day. We'd really like to thank Catriona and Sarah from The Wedding Emporium Banbury for having us along and letting us serenade them all day long! We are very excited to announce that we will performing at Castle Quay Shopping Centre in Banbury (OX16 5UN) on Saturday 24th February. We will be performing with our Acoustic Duo between 11.30am and 3.30pm and will be there as guests and recommended suppliers of 'The Wedding Emporium Banbury'. As a recent addition to their recommended suppliers list, we have been invited to go along and perform live and meet with lots of the couples who are currently planning their wedding with Catriona and Sarah from WEB. WEB hold a 7 day wedding showcase in the Castle Quay Shopping Centre twice a year and this year they will have a stand outside Debenhams in the main arcade from Monday 19th to Sunday 25th Feb. The ladies will be on hand all week to offer expert planning advice or any help you need, as well as there being lots of other highly recommended suppliers there throughout the week too. This public performance is the perfect opportunity for couples who haven't booked yet to come along and see us in action and have an informal and friendly chat about your live wedding music in a no pressure environment, along with a spot of shopping! If you have already booked us for the big day and would love to come along, then please get in touch with your song choices. When you pop along we can give you a personal rendition of your requests, giving you an advance preview of how we will sound on your wedding day. This is a great opportunity for us to work on these new additions to the set and get them perfected before your wedding this year. So if you happen to be in the area that weekend and would like to come along and say hi, please let us know and we can send you further details. We don't normally travel quite as far away to play at weddings, as we are preferred suppliers to so many of our local wedding venues in Northamptonshire, however Crab Manor is one of the most beautifully quirky venues we have ever played at. It was definitely worth driving the extra distance to be a part of Georgina and Michael's wedding, and, as these pictures show, it was a gorgeous spring day and the sun shined down! We performed 'Lucky' by Jason Mraz and Colbie Caillat for Georgina and Micheal's First Dance (see photo left with Matt in background!) which was a great choice as it has really beautiful lyrics for a wedding. There's a lovely mention about Taylormade in the blog too: "We found Taylormade on the internet as we were looking for some music during the day and evening. Our venue was quite small so a large band would not have worked – the duo were exactly what we wanted and everyone was dancing all night!!" That's the great thing about having the option of either our Acoustic Duo or 4 Piece Live Band, no matter how big or small your wedding venue or if you are on a small budget, you can still add a stunning soundtrack to your wedding day and add the unmistakable spark of live music with our Acoustic Duo. After our liveset we continued the evening with the DJ and everyone partied away until the small hours! We are feeling amazing today after Taylormade Acoustic Duo and Live Band were featured in this beautifully written and gorgeously photgraphed blog by 'Rock My Wedding'! The blog says about Taylormade: "A soundtrack to die for", "they made the wedding special and unique" and they even went as far as to name the blog 'The Sun Will Be Shining' after the lyrics in 'Songbird' which we performed as Gemma made her entrance. After such high praise, to say we are feeling totally awesome today would be an understatement! Gemma and Matt were married at the breathtaking Kingscote Barn in Gloucestershire and had booked us for their Ceremony and Drinks Reception with the Acoustic Duo and then our 4 PIece Live Band and DJ add-ons to get everyone up and on the dance floor for the evening reception. We performed 'Songbird' by Eva Cassidy as Gemma walked down the aisle to a nervous Matt, followed by 'Kiss Me' and 'All You Need Is Love' during the signing of the register. They then walked back up the aisle together as Husband and Wife to 'Greatest Day' by Take That. We then headed outide to make the most of the amazing October weather to perform outside in the sunshine on the breathtaking terrace. The blog reads: "We really loved the idea of having live music during our wedding ceremony and Taylormade Duo were perfect for this. Carley and Matt are a newly married couple themselves and Carley has such a beautiful voice that was perfect for my chosen song to walk down the aisle to “Songbird” by Eva Cassidy, accompanied by Matt on the acoustic guitar. The line “for you the sun will be shining” seemed particularly fitting on the day of our wedding as it was 28 degrees and beautiful sunshine outside in October, it really did feel like the sun was shining just for us! As we signed our register they sang "Kiss Me" by Sixpence none the richer and then "All You Need Is Love" by the Beatles and we walked back up the aisle to "Greatest Day" by Take That. The live music for the ceremony was really something that made the day special and unique and they then carried on playing whilst everyone had drinks outside. Taylormade then became a 4 piece live band for the evening followed by DJing for us and the dance floor was full all night!" Thank you so much to Gemma and Matt for having us and for saying such lovely things about our performances. We wish you a wonderful life together as Husband and Wife. Taylormade - preferred suppliers to Dodmoor House since 2010! We are incredibly proud to say that this year will be the 8th year that Taylormade has been highly recommended by the team at the beautiful Dodmoor House near Daventry, Northamptonshire. Taylormade are one of their preferred suppliers of live music and wedding entertainment, with both our Acoustic Duo and our 4 Piece Live Band being featured on Dodmoor House's website since 2010. We work closely with owner Louise and her amazing team to make sure the day runs seamlessly. You could even leave all the planning up to us and enjoy the build up to the big day, safe in the knowledge that Taylormade and Dodmoor House have it covered! We have performed stunning tracks during Wedding Ceremonies in the Courtyard Barn and played beautiful background music on the lawn during Drinks Receptions with our Acoustic Duo. We've also got everyone on the dance floor and partying the night away to our 4 Piece Live Band in the Catesby Barn during evening receptions. We can even follow our Live Band with our Wedding DJ until the very end of the night. If you'd like to find out more about how we can bring a spark to your wedding and why Dodmoor House have recommended us for all these years, then please get in touch. We would love to chat with you about your wedding day at Dodmoor House. We've received this beautiful 'Thank You' card from Sarah and Graham Jones whose Wedding we performed at in Cheshire on 24th July. We played as the Acoustic Duo during Sarah ad Graham's Ceremony, Drinks Reception and Early Evening and learned 'I Believe In A Thing Called Love' for their First Dance. It says: "Thank you so much for making our day truly perfect! Everyone has said how fantastic you were and we loved our First Dance!" They also left us this fantastic FIVE STAR REVIEW on our Google Plus page. "Music is a great passion of ours and Carley and Matt made our day so special by performing during our ceremony and receptions. They even learnt our first dance song especially for the day and DJ'd right into the night! Lovely people with amazing talent. Thank you again to you both!" We performed as the Acoustic Duo at Becky and Jon's Wedding at the gorgeous Dodmoor House in Northamptonshire on 21st May 2016. "I just wanted to send a quick message and say a massive thank you on behalf of myself and Jon for performing at our wedding. You were both so professional from start to finish and were a delight to work with. The music was absolutely perfect and all our guests commented on how wonderful you were. Thank you again!" Thank you so much for your lovely email both, it was such a pleasure to be a part of your day. We wish you all the very best for the future! We have been preferred suppliers to Dodmoor House in Northamptonshire for about 8 years now and it's always lovely to return to this stunning venue. Charlotte and Stuart Johnston were married here in a stunning ceremony there last July and it was such a privilege to be a part of their special day. They are one of the sweetest couples we have ever played for and could not have been more perfect for each other. We played as the Acoustic Duo on Dodmoor House's stunning Croquet Lawn during their Drinks Reception as the weather held out for them. Later that evening we performed their First Dance of 'Chasing Cars' by Snow Patrol before getting the party going with the 4 Piece Live Band...the dance floor was packed all night! Massive congratulations Charlotte and Stuart. We wish you all the very best for your lives together with days filled with love laughter and sunshine. Thank you to Sarah Vivienne Photography for allowing us to share these beautiful shots. We are really proud to say that we've received this wonderful email from Chrissie and Ian whose Wedding Reception we performed at on 30th January 2016 at the lovely Dodmoor House in Northamptonshire. You two are amazing; nothing but the highest compliments for how incredible the whole package was; so many guests wanted your contact details and we can't wait to have another big party so we can hire you again. X"
Chrissie and Ian tied the knot in a beautiful wedding ceremony on the beach in the Florida Keys just days before heading back to the UK to have their party and reception with friends and family. It was a beautiful evening and the Acoustic Duo was just perfect to bring a fantastic atmosphere but still allowing Chrissie and Ian to catch up with their friends and family who hadn't been able to make it over the pond to their Wedding. Thank you so much for your lovely note Mr and Mrs Kelly. Wishing you all the very best for the future. It's been a busy 2016 for us so far playing at loads of beautiful Weddings and Parties! Keep an eye out for plenty more tracks being added to set list very soon! Happy New Year! How Long Will I Love You Demo. It's been a few months since I've had a moment to catch up on these blogs but I wanted to start the year by sharing with you a demo we recorded for Yvette and Andy back last Summer. Yvette and Andy got married at Dodmoor House in Northamptonshire on 30th July 2015 and a few weeks before the Big Day Yvette asked us to record 'How Long Will I Love You' by Ellie Goulding for her so should could practice and time her walk up the aisle. It was our pleasure to do so and this is our version of the beautiful 'How Long Will I Love You'. This song is one of our most requested tracks and it's obvious from the lyrics why. Maybe we will be performing it for you during your Wedding Ceremony or First Dance this year. If so, we can't wait! We really hope you enjoy and look forward to performing at your Wedding very soon. On 16th May we headed about 25 minutes east to Northampton to perform as the Acoustic Duo at The Marriott Hotel for Emma and Keith's Wedding. Keith had booked us as a surprise for his lovely fiancée Emma, so all of the details has been confirmed in 'Top Secret'! Keith had told us the 6 tracks that Emma had chosen for the Ceremony and it must have been fate that we knew 5 of the 6! The only track that was not yet on our set list was 'All Of Me' by John Legend and so we were very happy to learn this at Keith's request. 'All Of Me' is an absolutely beautiful track and is now a firm favourite for Ceremonies and First Dances. WEDDING TIP 1: If there is a track that you have always imagined walking down the aisle to but it's not on our set list...don't panic! As part of our packages we offer to learn one special track completely free of charge with the acoustic duo...so you can have the Wedding you've always dreamed of! We arrived at the venue to meet a nervous, yet excited Keith and set up at the back of the lovely Ceremony room...The Delapre Suite. With 180 degree views of the countryside, it was the perfect room for a Summer Wedding! At 99% percent of the Weddings we perform at we play 2 tracks as the guests are taking their seats and waiting for the arrival of the Bride. Keith had chosen a lovely mix of old and new tracks and we started our performance with 'Viva La Vida' by Coldplay and 'Let's Stay Together' by Al Green. Emma had always wanted to walk down the aisle to the candlelight mix of 'Heaven' by DJ Sammy so Matt had learned a special candlelight version of the track on his guitar especially for Emma. When Emma walked through the door she was definitely surprised to see us but the beaming smile showed Keith she was loving every moment. We found a lovely place to stop in the track as the registrar announced "Please take your seats". The Ceremony was filled with giggles and fun, an informal yet touching start to their married lives together. During the signing of the register we played 2 more tracks and these were 2 more fantastic modern choices; 'Thinking Out Loud' by Ed Sheeran and the track we learned especially for Emma 'All Of Me' by John Legend. (See Photo). WEDDING TIP 2: It takes about 10 minutes to sign the register with photo opportunities, witnesses etc so it's best to choose 2 tracks to ensure that there's no long gap between the music ending and the registrar starting again. When Emma and Keith had finally exchanged rings and signed the register it was time to move on to the Drinks Reception and photos. To a rapturous applause, the brand new Mr and Mrs Chatterton emerged to the strains of 'How Long Will I Love You' by Ellie Goulding...a fitting track for such a lovely occasion. We'd like to wish Emma and Keith all the very best for their lives together and thank you so much for choosing us to be a part of your most cherished days.